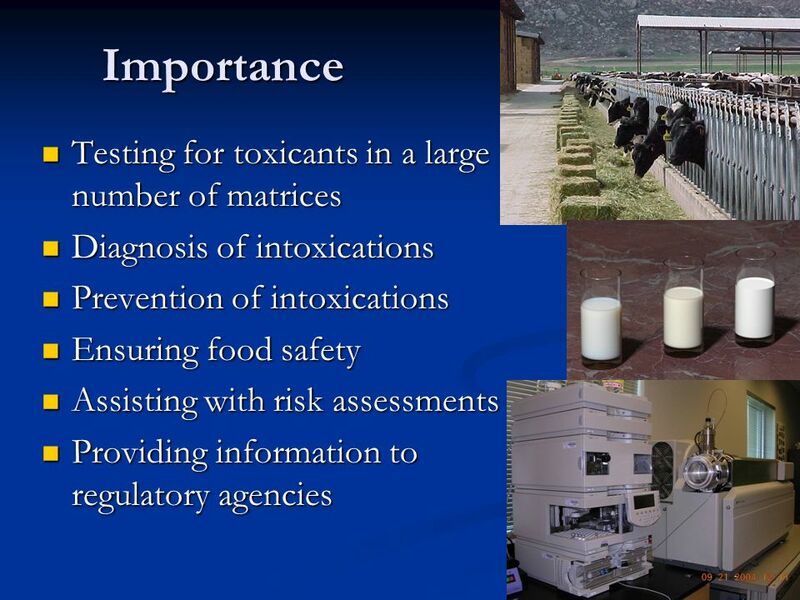 The Importance of Veterinary Toxicology for Animal Agriculture and the Food Supply Thank you very much for inviting me to speak at the Annual NIAA meeting. 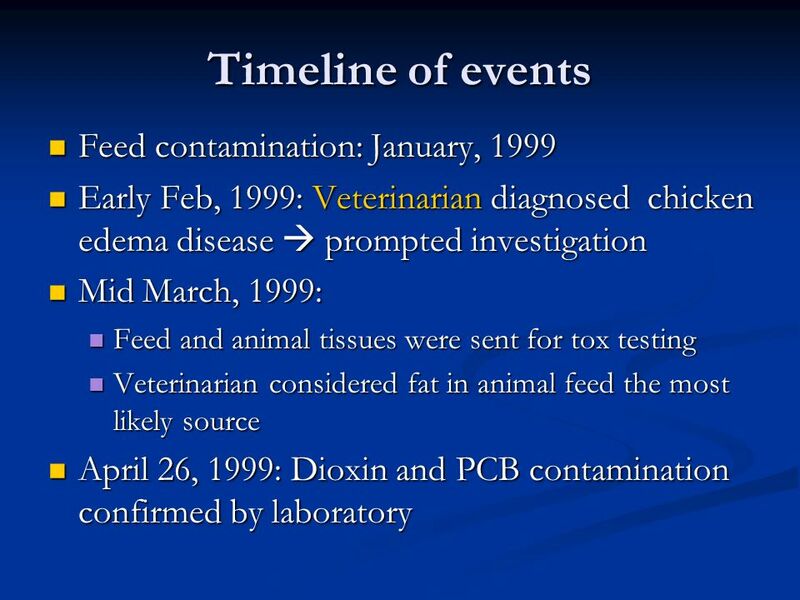 Early Feb, 1999: Veterinarian diagnosed chicken edema disease  prompted investigation Mid March, 1999: Feed and animal tissues were sent for tox testing Veterinarian considered fat in animal feed the most likely source April 26, 1999: Dioxin and PCB contamination confirmed by laboratory Edema disease typically seen in chickens after dioxin or PCB exposure! 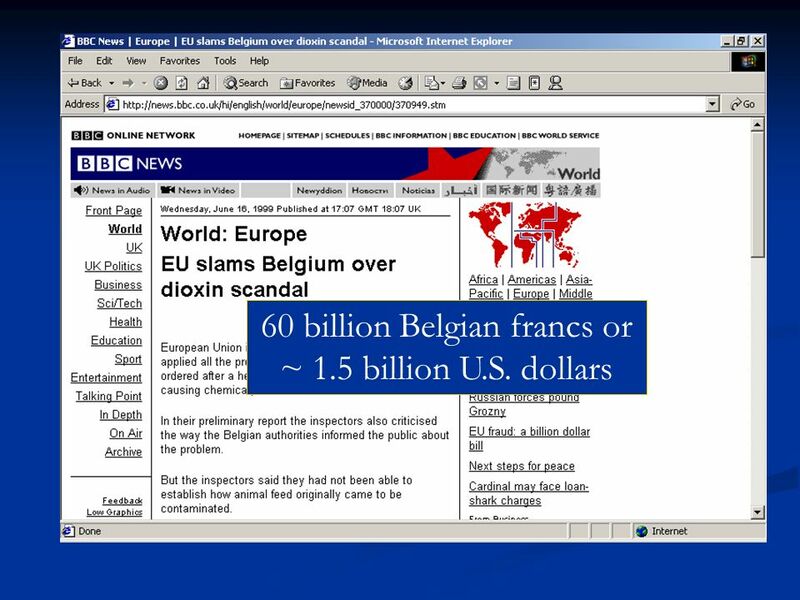 Public confidence in government was damaged 2 cabinet ministers resigned and it also lead to the ousting of the ruling party in a national election Major mistake made by the government: they did not promptly go public with the knowledge of the crisis, resulting in accusations of self-serving cover-up The mixing of contaminated animal feed occurred in January The Belgian Public Health Minister announced the ban on May 27, The government knew of the problem as early as Mid March and the presence of high levels of dioxins was confirmed on April 26, 1999, one month before the contamination was made public. On Feb 4: changes were noted in chickens: decrease in egg production and hatching, and epidemic of chicken edema disease! 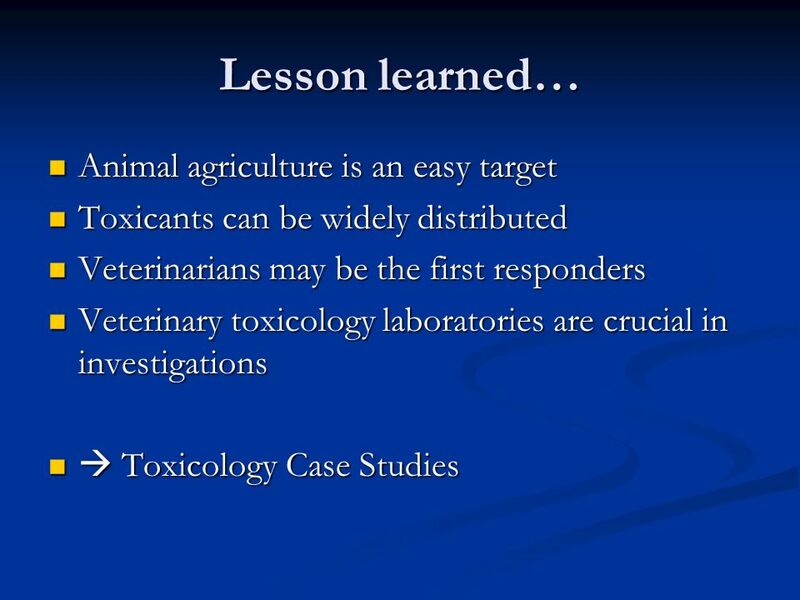 Toxicants can be widely distributed Veterinarians may be the first responders Veterinary toxicology laboratories are crucial in investigations  Toxicology Case Studies Animal agriculture is an easy target, whether in form of an intentional terrorist attack or whether in cases of accidental contaminaton Case studies are a great way to learn from and illustrate the importance of veterinary toxicology A crisis can hit any organization unexpectedly and have devastating results. The case studies presented here show how labs and involved agencies can prepare themselves to best handle disastrous poisonings of animals and people, establish accurate diagnoses, work with regulatory agencies and deal with publicity. 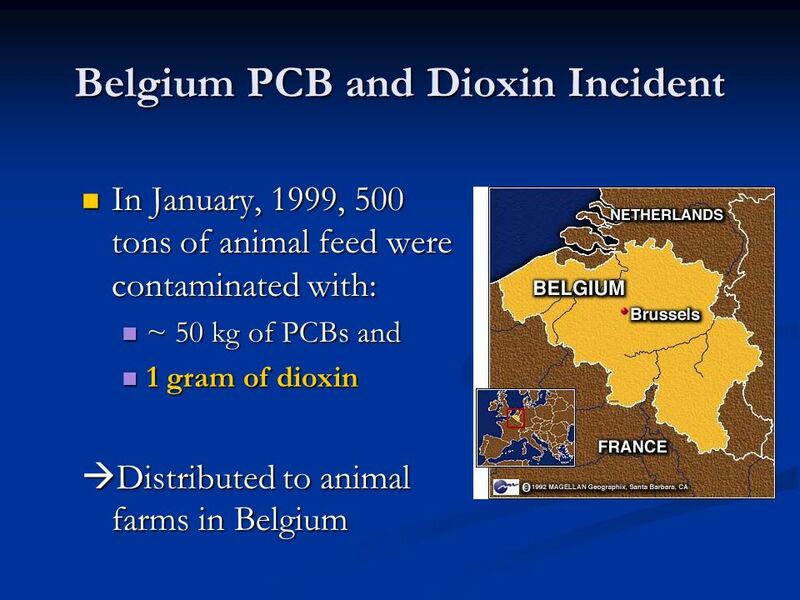 Poisonings serve as case studies to shed light to an area of feed and food safety that has been pushed to the wayside: Frequently, the idea that large quantities of chemicals or toxicants are required to generate toxic effects is mentioned as a factor contributing to limited attention to chemical agents in comparison to biological agents A safe and secure food supply is an essential component of the nation’s infrastructure. 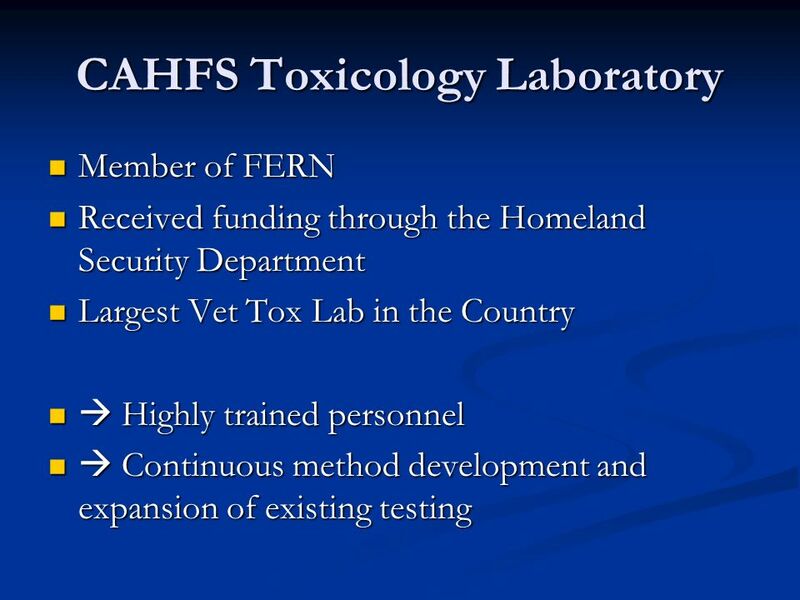 To that end, vet tox labs have responsibility for the safety of the food supply and play an integral part to detect contaminants and to perform routine surveillance testing. 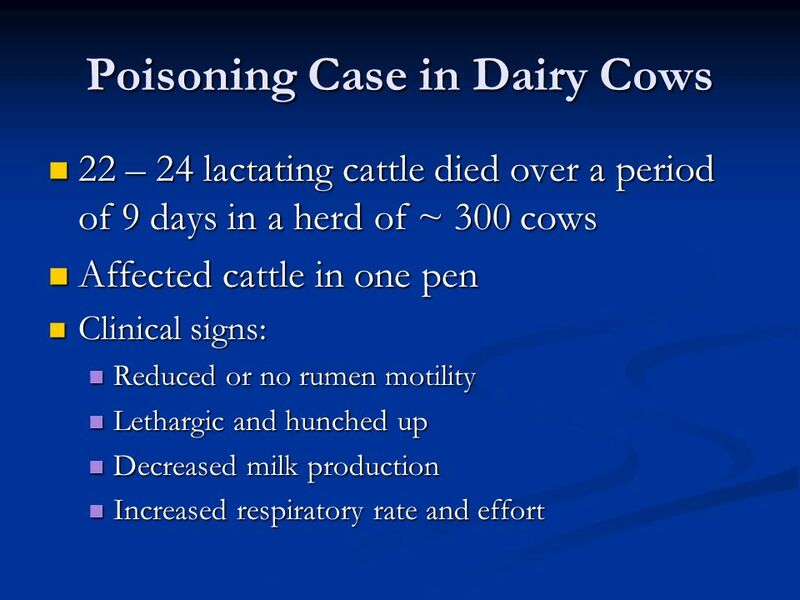 22 – 24 lactating cattle died over a period of 9 days in a herd of ~ 300 cows Affected cattle in one pen Clinical signs: Reduced or no rumen motility Lethargic and hunched up Decreased milk production Increased respiratory rate and effort Poisonings serve as case studies to shed light to an area of feed and food safety that has been pushed to the wayside: Frequently, the idea that large quantities of chemicals or toxicants are required to generate toxic effects is mentioned as a factor contributing to limited attention to chemical agents in comparison to biological agents A safe and secure food supply is an essential component of the nation’s infrastructure. To that end, vet tox labs have responsibility for the safety of the food supply and play an integral part to detect contaminants and to perform routine surveillance testing. 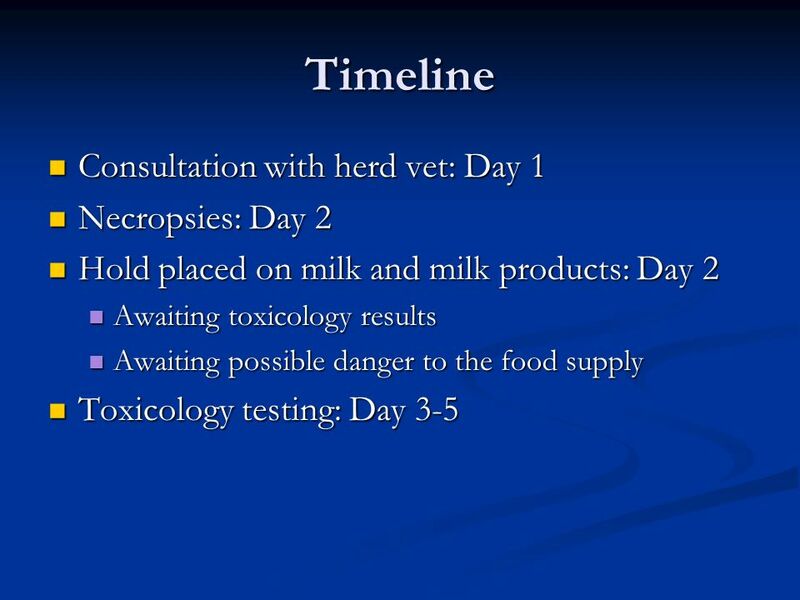 Hold placed on milk and milk products: Day 2 Awaiting toxicology results Awaiting possible danger to the food supply Toxicology testing: Day 3-5 Tox samples arrived in Tox lab on Saturday morning at 8.30 AM. Testing began right then and went all the way through Monday evening. 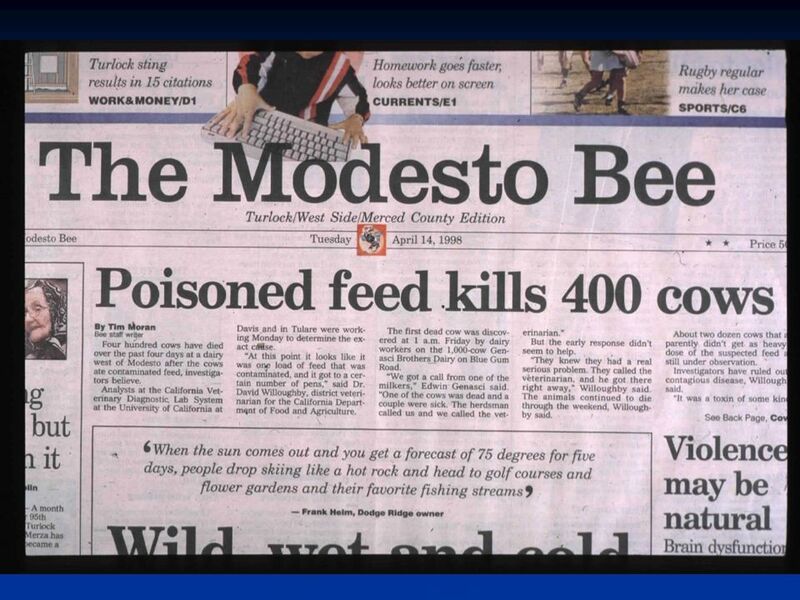 14 In 1998, 427 Holstein dairy cows (out of 431 total in affected pens) over a 1-week period in the Tulare area. 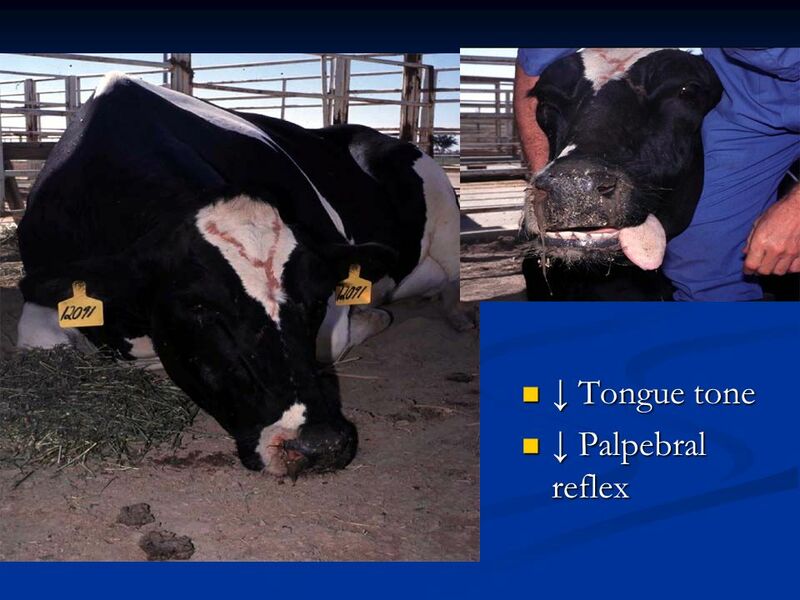 Affected cows had signs of watery diarrhea, recumbency and weakness. Something ended up in the feed that resulted in this disaster. What was it? 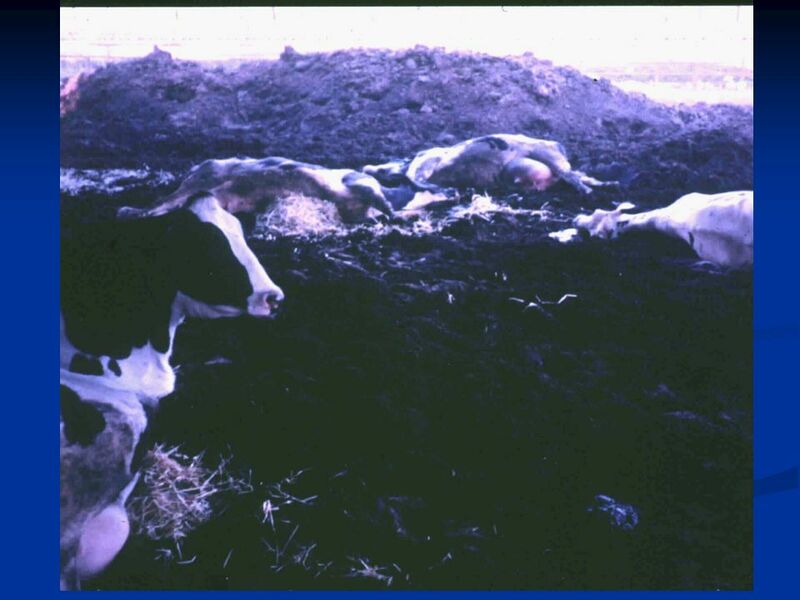 Dead cat carcass was found in feed and resulted in Botulism At this dairy, contaminated carcasses were rendered at a heat sufficient to destroy both the toxin and the spores. In general, the spores are destroyed at temperatures of > 120 C for 5 minutes under moist conditions. The affected pens were fed a TMR that consisted of approximately 25% grain premix, silage, haylage, alfalfa hay, oat hay, mineral mix, and whey. 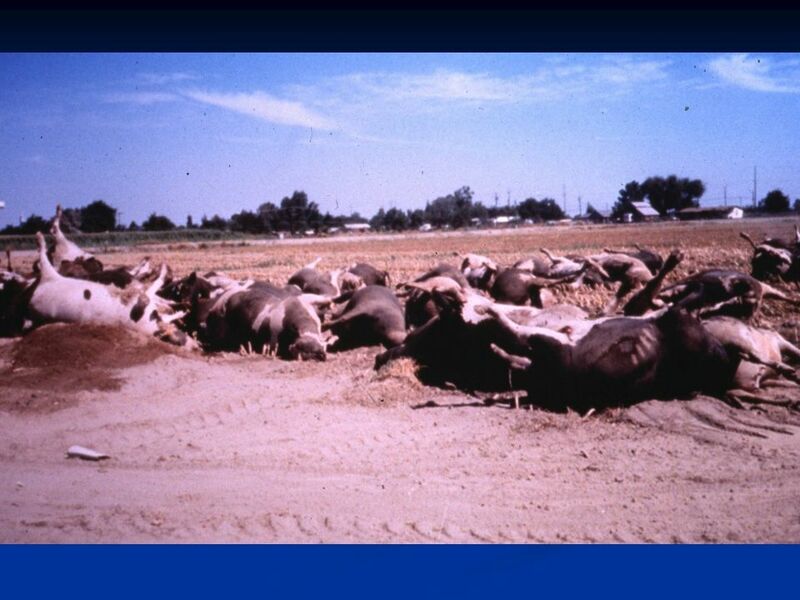 Historic review suggested that a load of TMR, fed at noon the day before the first cases appeared (18 hours previously), may have included a rotten bale of oat hay that contained a dead cat. 15 March 2006 A family of 5 had dinner together. (Sunday 3/28). 3 developed profuse vomiting and diarrhea after dinner. Dinner included a dish made with mushrooms bought from a local Asian food market and a popular local farmers market. Armenian family – not much english. 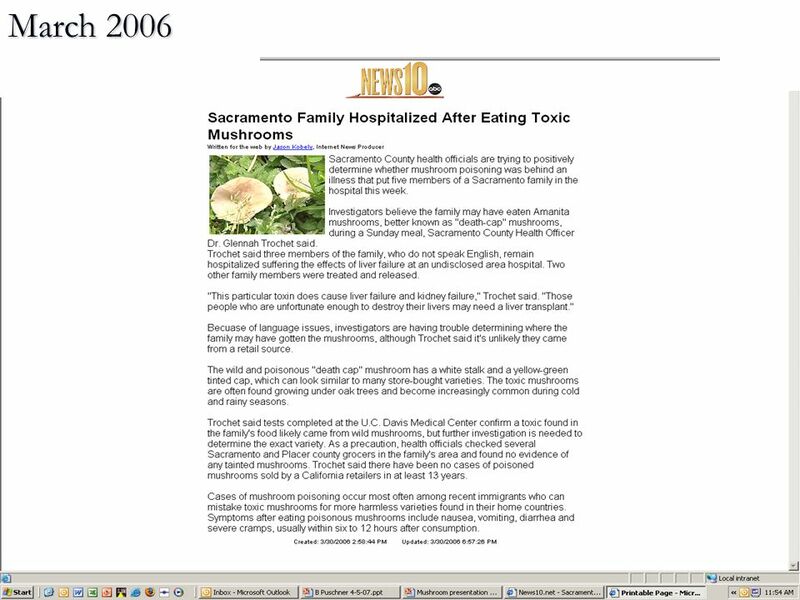 Sac and Placer County Public health inspected all establishments that could be involved and have found no unsafe practices and no dangerous mushrooms being sold. CONCLUSION: the poisoning is NOT related to mushrooms bought at retail. 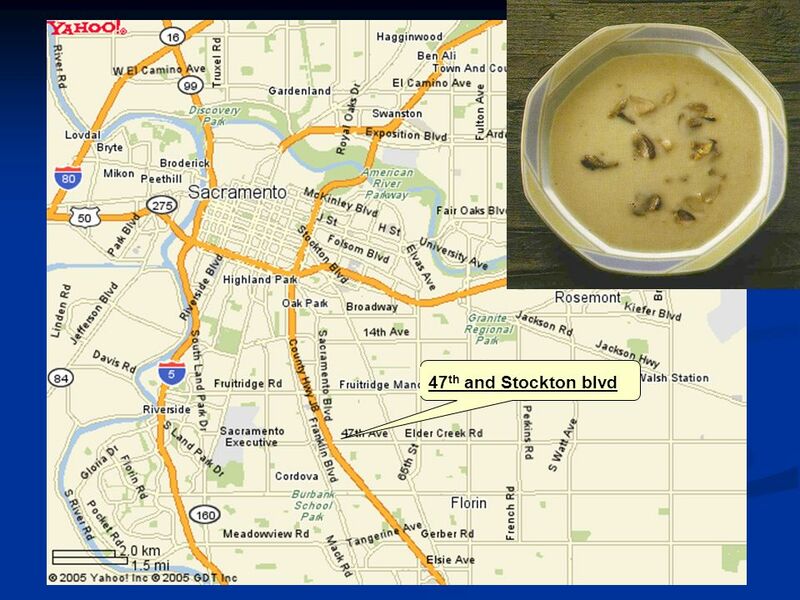 Update from the Vet School group (Bob Poppenga): Interestingly enough, there were some cooked mushrooms left. One of my mycologists at UC Davis campus was contacted about doing a DNA identification of the mushrooms. But because the mushrooms were already cooked, much of the protein, and therefore the DNA, was too denatured to work with. The Vet School Diagnostic Lab was contacted to see if they could run their amatoxin assay on the cooked mushrooms. 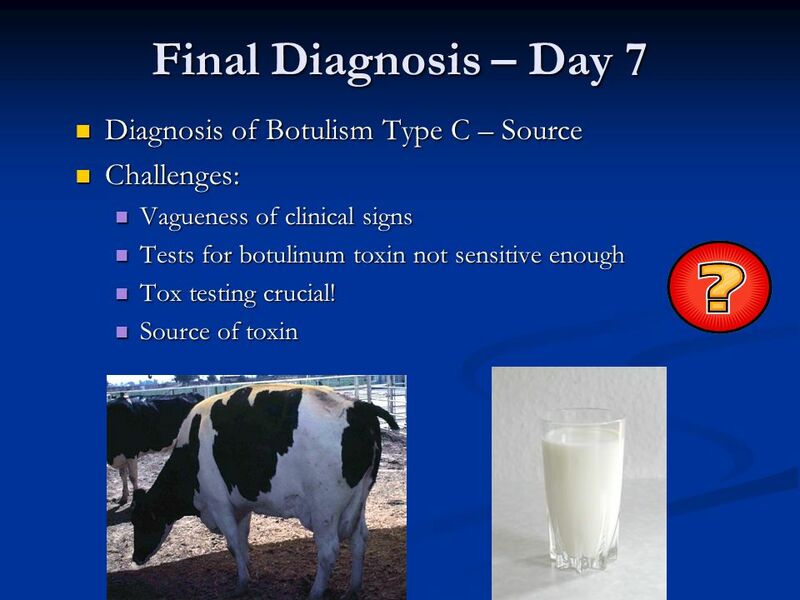 They had a positive result for amatoxins within an hour and reported their results back. The Diagnostic Lab is actually going to run assays on the serum of several of the family members to see if they can detect amatoxins. They will report back on their results. 17 Cooked mushroom samples positive for alpha- and beta- amanitin. 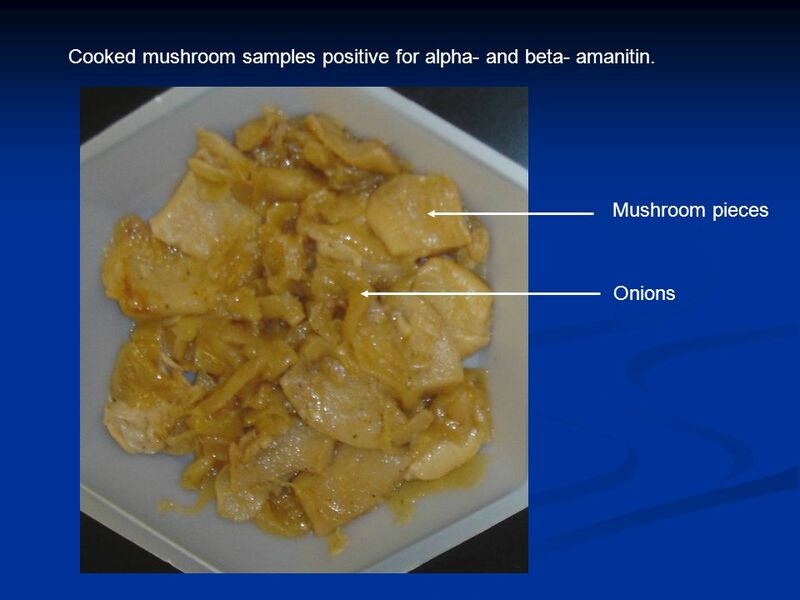 Mushroom pieces Onions The two "cooked" mushroom samples (labeled "Abraham Nalbandyon ate these mushrooms" and "mushrooms consumed by Martin Kagramanya" were positive for alpha- and beta- amanitin. 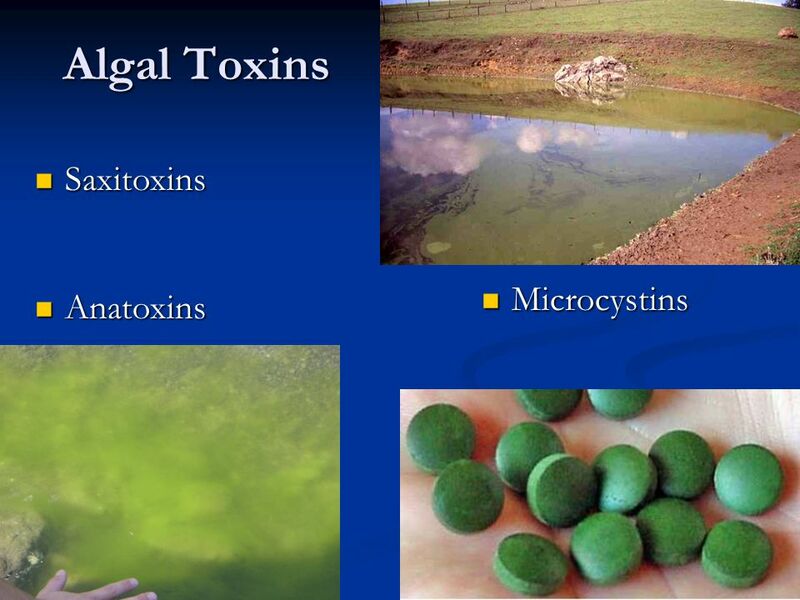 The presence of these toxins were confirmed using our new LC/MS/MS based method. 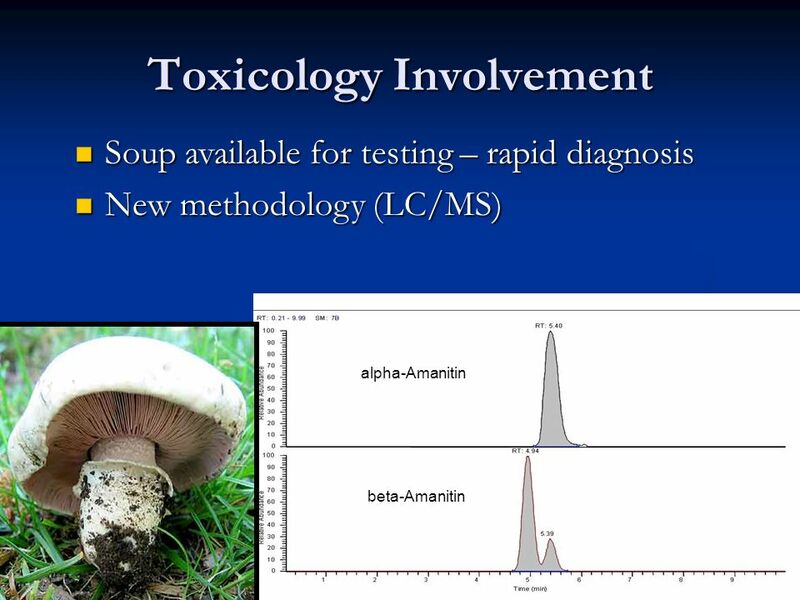 Soup available for testing – rapid diagnosis New methodology (LC/MS) beta-Amanitin alpha-Amanitin Chromatogram of Amanitins in Cooked Mushrooms Update from the Vet School group (Bob Poppenga): Interestingly enough, there were some cooked mushrooms left. 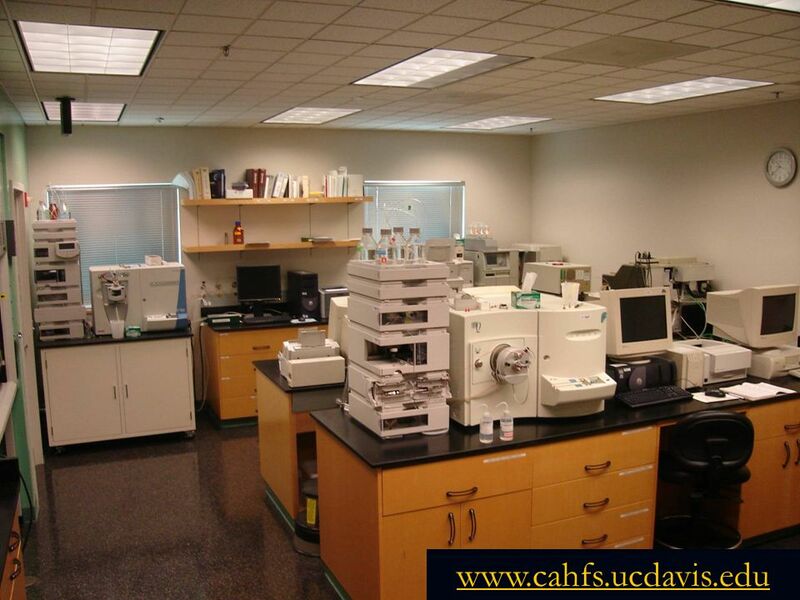 One of my mycologists at UC Davis campus was contacted about doing a DNA identification of the mushrooms. But because the mushrooms were already cooked, much of the protein, and therefore the DNA, was too denatured to work with. The Vet School Diagnostic Lab was contacted to see if they could run their amatoxin assay on the cooked mushrooms. They had a positive result for amatoxins within an hour and reported their results back. The Diagnostic Lab is actually going to run assays on the serum of several of the family members to see if they can detect amatoxins. They will report back on their results. The only samples from the people that we received were serum samples. We received samples from 5 individuals. Serum was taken at a variety of time points after exposure. For two of the individuals, there were serum samples taken within 24 hours of ingestion. For the other three people, the closest time points to ingestion were within 48 hours. The two samples taken within 24 hours were positive for alpha-amanitin. The three samples at 48 hours were negative (although I think one of them showed evidence of amanitin, it was not good enough to call positive). 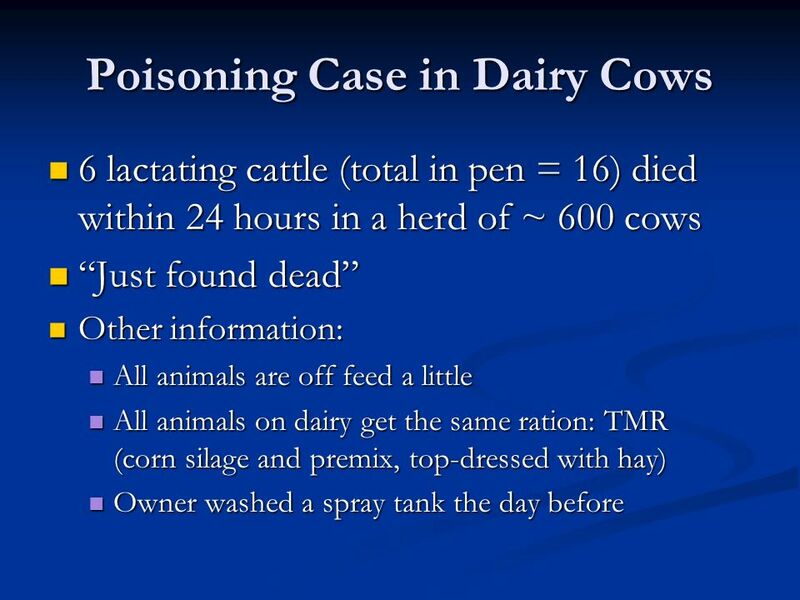 6 lactating cattle (total in pen = 16) died within 24 hours in a herd of ~ 600 cows “Just found dead” Other information: All animals are off feed a little All animals on dairy get the same ration: TMR (corn silage and premix, top-dressed with hay) Owner washed a spray tank the day before Containing round-up and Goal Goal: oxyfluorfene Protox inhibitor herbicides appear to inhibit mammalian mitochondrial Protox. When ingested in animals, an increase in porphyrin levels occurs. However, due to effective metabolism and/or excretion, porphyrin levels return to normal within a few days. Variegate porphyria is caused by a deficiency of Protox, and variegate porphyria-like symptoms can be generated in mice with high doses. Little bioaccumulation risk occurs in animals, even following exaggerated dietary doses (>100 times recommended field rates). 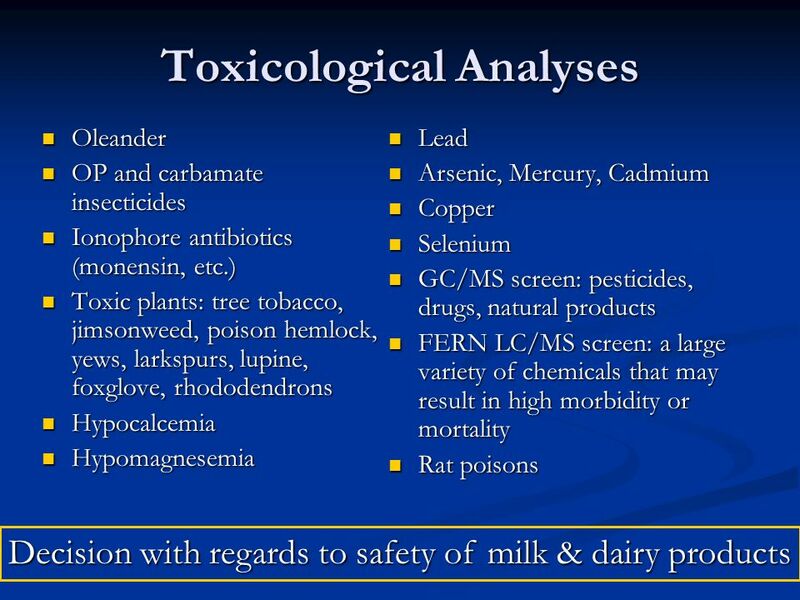 In healthy humans, these herbicides are not considered to pose any significant toxicological risk (Dayan et al, 2001). 1) In mammalian hepatocyte cultures, exposure to these herbicides has been shown to result in an accumulation of protoporphyrin IX. These herbicides induce porphyrin accumulation in hepatocytes in a concentration-dependent manner (Jinno et al, 1999). Birchfield & Casida (1996) demonstrated rapid, specific, saturable, and reversible binding of a Protox inhibitor radioligand to mouse liver mitochondria. 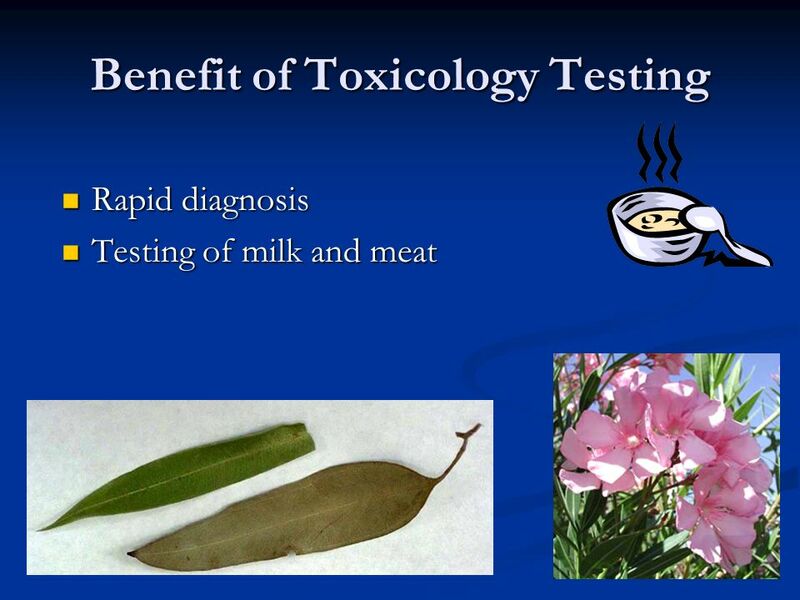 Rapid diagnosis Testing of milk and meat Special Investigator Chris Hansen went to the dairy on John DeGroot stated that the landscaper has taken care of their place for years and he always parks near the hospital pen and he had no oleander clippings. They found a portion of an oleander leaf in the mixer wagon. 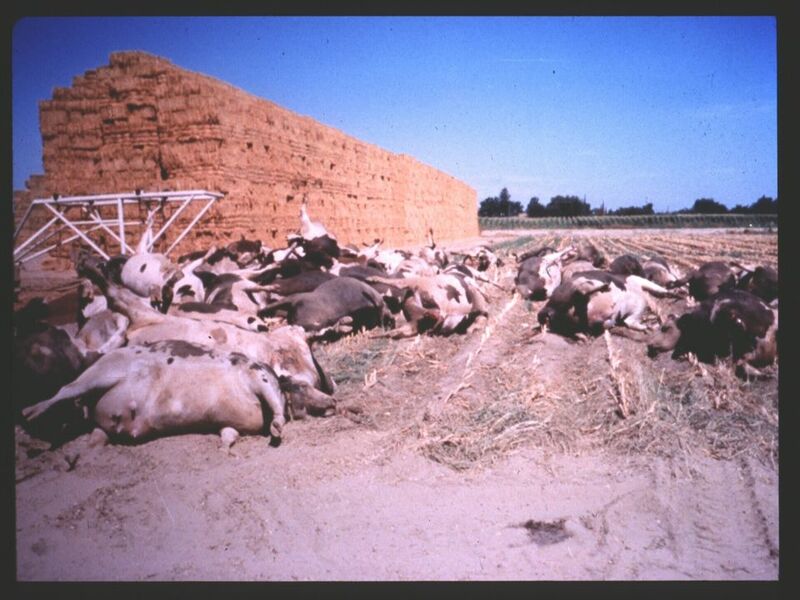 None of the hay that is being used has been observed to contain any oleander leaves. The hay growers field was observed and there are not any oleander plants anywhere around as far as you can see. However there is a road to a dump along one side of the field and there was trash and tree trimmings along this road. Our investigator suspects that some oleander trimmings at some point got into the field from material that was suppose to go to the landfill dump. The dairy is going to keep a close eye on the hay to check for oleander leaves. It seems to be an isolated incident at this time. 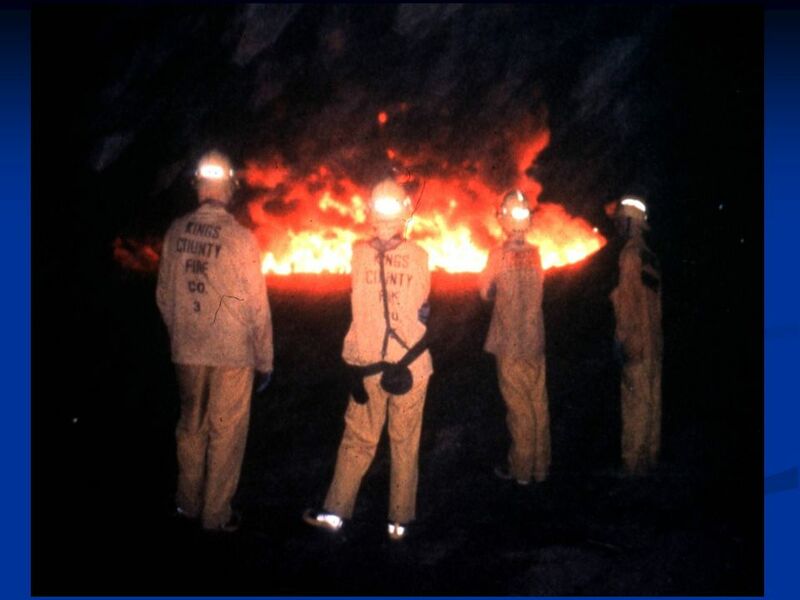 22 Perchlorate What is known about perchlorate: has been the subject of discussion since Then, concerns began to increase in 1997 when it was found in Lake Mead. The entire lower CO river is contaminated, ostensibly from the manufactering of ammonium perchlorate. 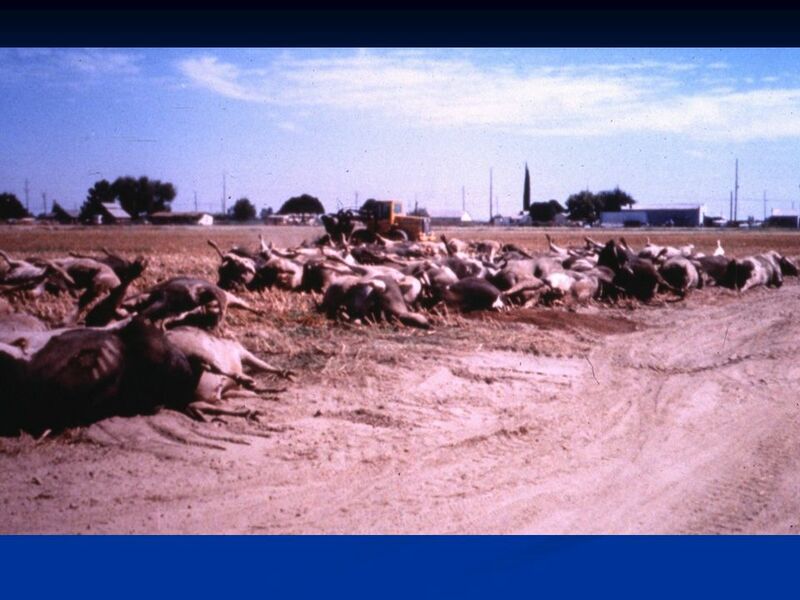 Water from the CO river irrigates more than 1.8 Million acres of land – producing some 15% of the nation’s crops and about 13% of its livestock. Bioconcentration can occur in foods: lettuce and other broadleaf vegetables are particularly susceptible Alfalfa accumulates perchlorate! Affects the thyroid gland; Potential for developmental effects; Has been found in drinking water over the last 5-10 years Main sources: Ammonium perchlorate is used as an oxidant component in solid rocket fuel (it’s main use) Also used as an oxidant in matches, fireworks, airbag inflation systems, and a variety of other industrial applications incl. 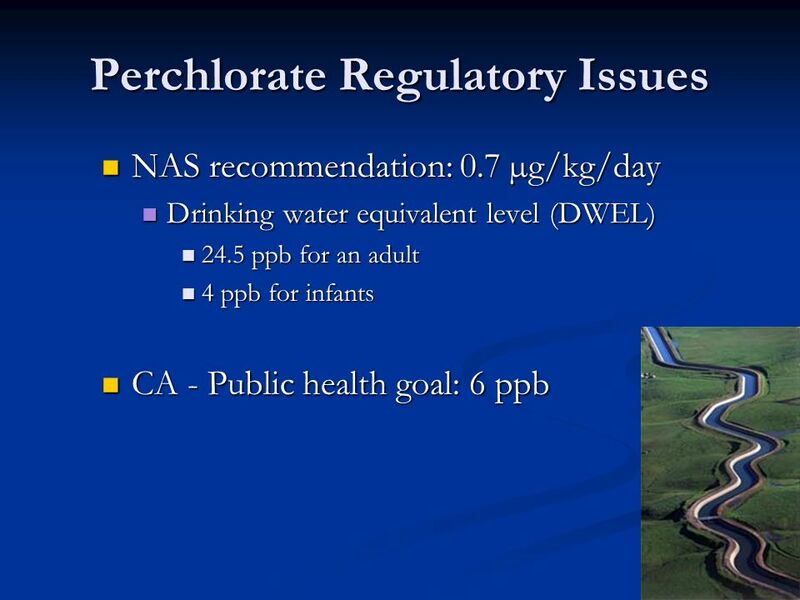 the production of dyes, paints and rubbers Perchlorate appears to be naturally present in the environment as well Currently no federal regulatory limit for drinking water Cal-EPA: Public Health Goal = 6 ppb Mass. Department of Environmental Protection: PHG = 1 ppb Previous studies by Kirk et. al. 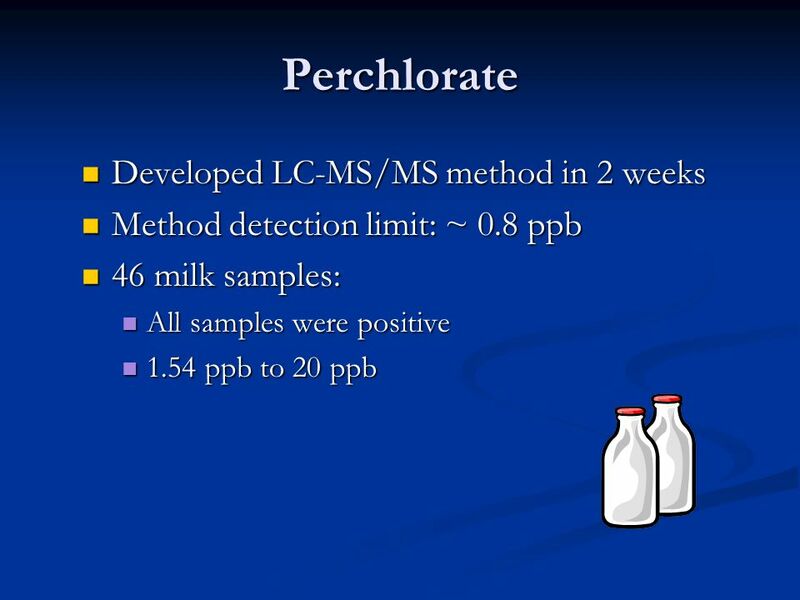 (Texas Tech University): Perchlorate analysis of seven milk samples (cartons purchased from various stores in Lubbock, TX. Environ. Sci. 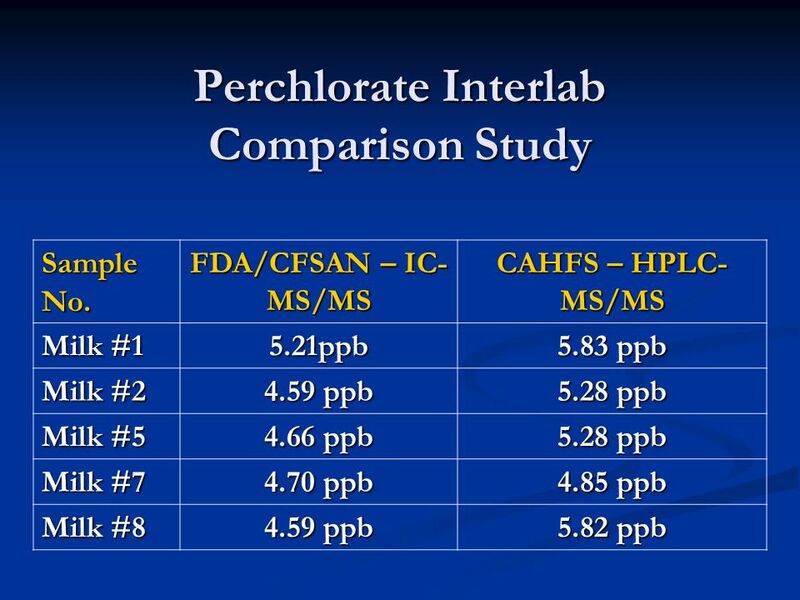 Technol , All seven samples were positive for perchlorate at levels from 1.1 µg/L to 6.3 µg/L (ppb). Sample No. 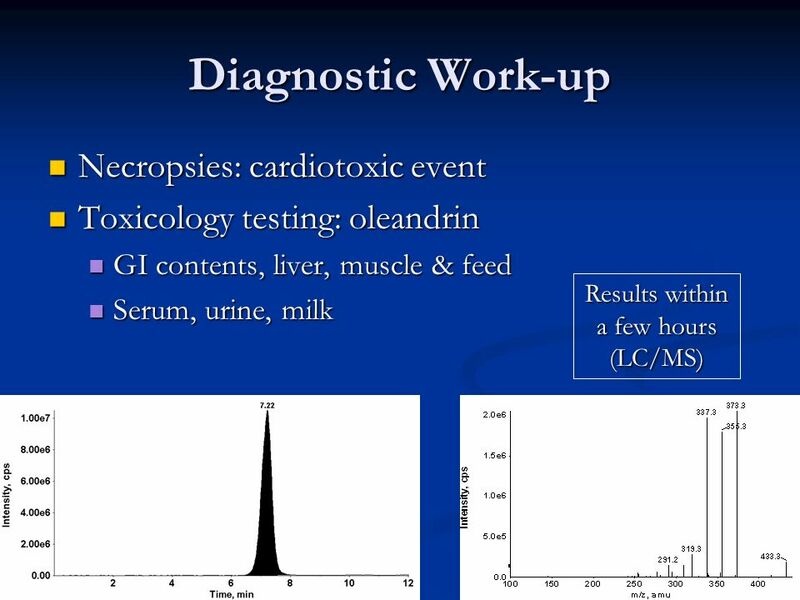 FDA/CFSAN – IC-MS/MS CAHFS – HPLC-MS/MS Milk #1 5.21ppb 5.83 ppb Milk #2 4.59 ppb 5.28 ppb Milk #5 4.66 ppb Milk #7 4.70 ppb 4.85 ppb Milk #8 5.82 ppb Now, researchers led by Purnendu Dasgupta, a chemist at Texas Tech University in Lubbock, US, have published the first known study of perchlorate in breast milk. They found the substance in each of 36 breast-milk samples taken from 18 states and in all but one of 47 dairy milk samples from 11 states. The average level in breast milk was 10.5 micrograms per litre, while the average in dairy milk was 2.0 micrograms per litre. That compares with the limit of 24.5 micrograms per litre standard for drinking water, according to new guidelines set on Friday by the US Environmental Protection Agency. The new guidelines were drawn up according to the amount deemed safe for an average adult by a recent US National Academy of Sciences study. 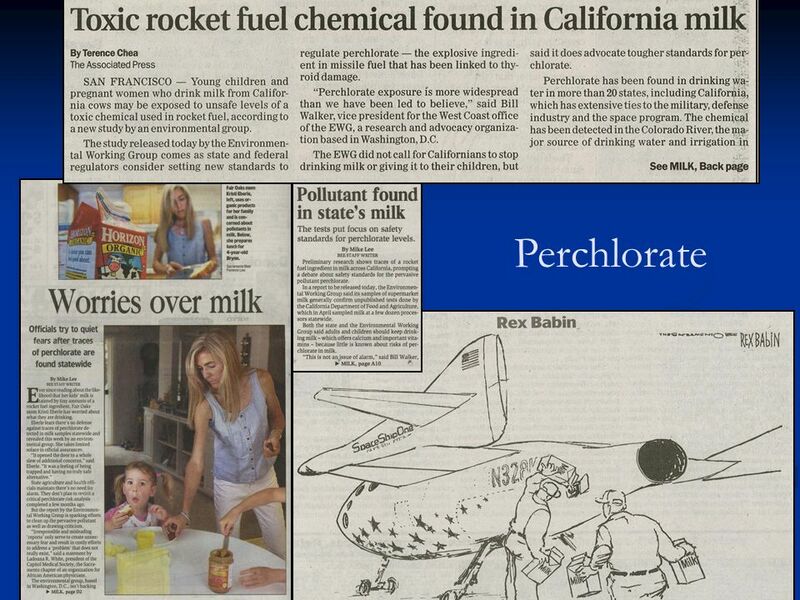 But the NAS reports that a "safe" perchlorate-intake limit should be set at about 4 micrograms per litre for a baby. 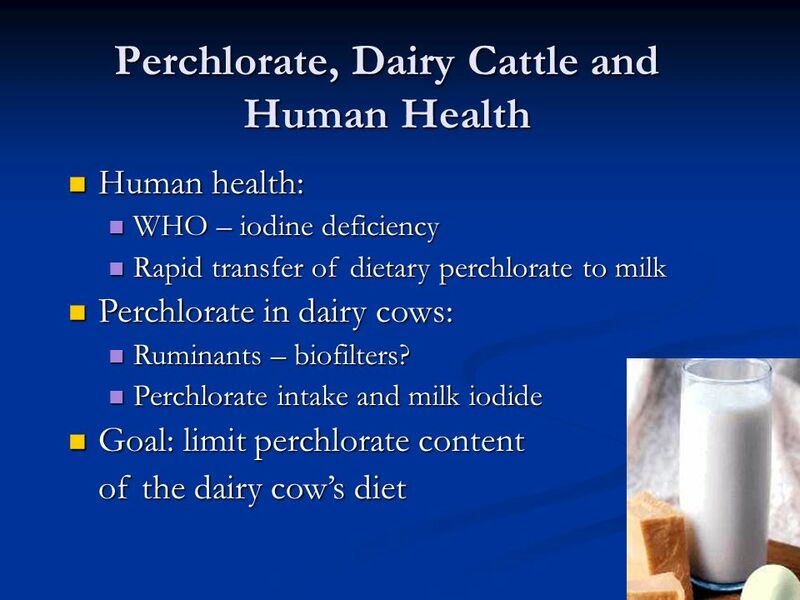 The NAS study concluded there is "insufficient data" to establish a definitive link between perchlorate exposure and neurodevelopmental problems, but animal studies suggest perchlorate can damage the thyroid, which regulates metabolism. 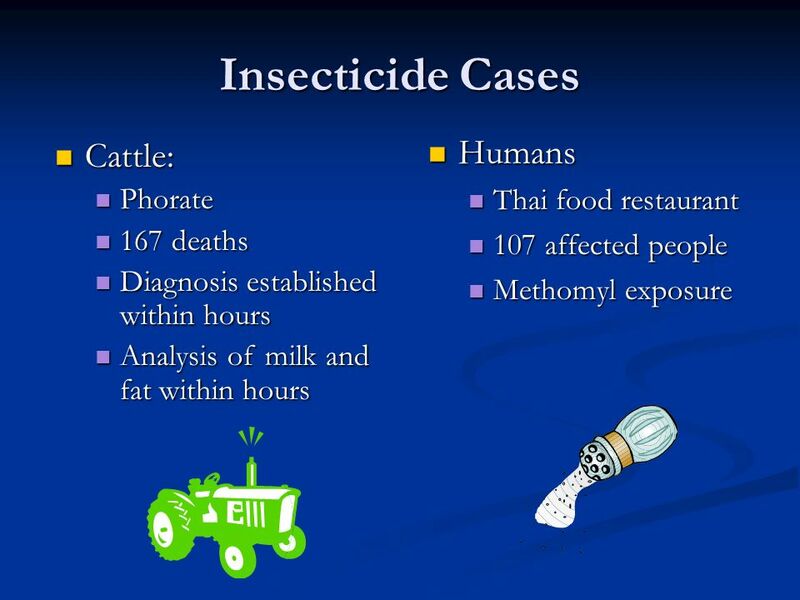 107 affected people Methomyl exposure Cattle: Phorate 167 deaths Diagnosis established within hours Analysis of milk and fat within hours Patrons of the restaurant. A case (n = 107) was defined as dizziness, nausea, or vomiting occurring in a person who ate at the restaurant between December 20, 1998, and January 2, 1999, with onset of symptoms within 2 hours of eating. A control (n = 169) was a person who ate at the restaurant during the same period but reported no symptoms. MAIN OUTCOME MEASURES: Odds ratios (ORs) of illness associated with food exposures; ORs of shifts during which illness occurred associated with certain cooks; laboratory results. RESULTS: The median latency period was 40 minutes from beginning eating to first symptom and was 2 hours to onset of diarrhea. The median duration of symptoms was 6 hours. Twenty-six persons (24%) visited the emergency department or were treated by a physician; no person required hospitalization. Patients reported nausea (95%), dizziness (72%), abdominal cramps (58%), headache (52%), vomiting (51%), chills (48%), and diarrhea (46%). Fifty-one cases (48%) included dizziness, lightheadedness, or a feeling of disequilibrium as the initial symptom. Illness was statistically associated with several foods and ingredients, but no single dish or ingredient explained a substantial number of cases. The analysis of food exposures included salt added by cooks, as estimated by using the amount of salt in the recipe for each dish and the amount of each dish eaten by respondents. This association was stronger with increasing levels of salt: ORs for illness among persons who consumed more than 0.42 to 0.84, more than 0.84 to 1.25, and more than 1.25 tsp of salt added to foods in the kitchen were 1.9 (95% confidence interval [CI], ), 3.0 (95% CI, ), and 4.0 (95% CI, ) compared with persons who consumed less than 0.42 tsp (P value for trend =.004). 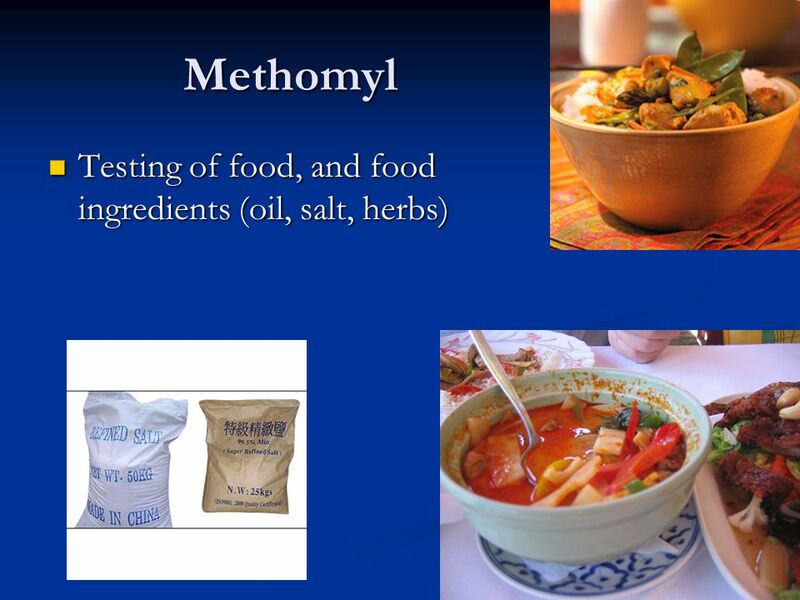 Methomyl, a highly toxic carbamate pesticide, was identified in a sample of vomitus (20 ppm) and in salt taken from containers in the storeroom (mean, 5600 ppm) and the stovetop (mean, 1425 ppm). The oral toxic dose causing illness in 50% of those exposed to methomyl was estimated to be 0.15 mg/kg of body weight (estimated range, mg/kg of body weight). The presence of cook A was associated with shifts during which cases of illness occurred (OR, 10.4; 95% CI, ). CONCLUSION: This outbreak of gastrointestinal illness was associated with the consumption of food seasoned with methomyl-contaminated salt. To allow rapid assessment for further investigational and control measures by health officials, physicians should report suspected outbreaks of illness to public health departments, however trivial the symptoms or cause may seem. 29 Phosphorodithioate (2 S, 2 O): Di-ethoxy compound! Soil and systemic insecticide: As a rootworm killer, designed to be taken up by the plant On corn, beans, peanuts, potatoes, sorghum, soybeans, sugar beets, sugarcane, wheat In INDIA: extensively used on rice (to kill the brown plant hopper!) Rat: oral LD50 = 2 – 4 mg/kg bw; dermal LD50 = 2 – 6 mg/kg bw Bird: oral LD50 = 0.62 mg/kg bw Fish: LC50 (96 hours) = 6 – 13 ppb HOW DID IT HAPPEN: Thimet was in almond hulls in the commodity barn. Not exactly sure how it got there, but that’s were it was. It was unclear why the feeder was unable to observe the presence of thimet or to smell the pesticide. 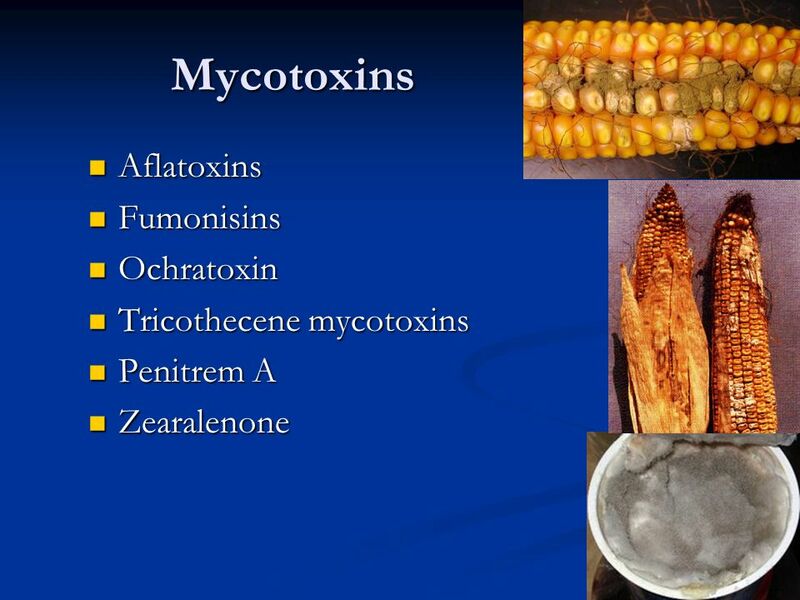 Penitrem A Zearalenone Top: aspergillus flavus – aflatoxin production Middle: fusarium rot – fumonisins Bottom: penitrem A – cream cheese Corn is the largest grain commodity imported into CA from other states. 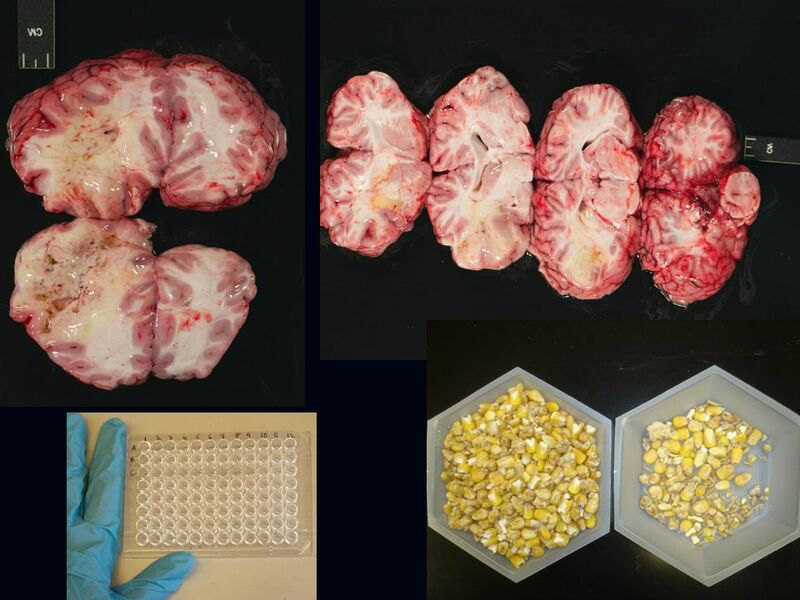 Because of the frequency with which aflatoxins and fumonisins were found, whole corn entering CA should be routinely monitored by the state feed program and grain distributors to ensure a supply of safe feed. 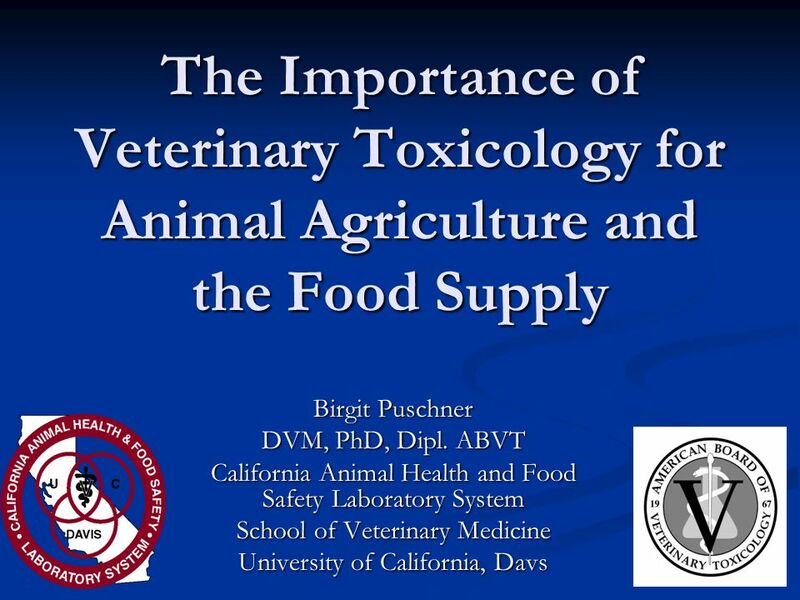 Download ppt "The Importance of Veterinary Toxicology for Animal Agriculture and the Food Supply Thank you very much for inviting me to speak at the Annual NIAA meeting." Judith E. Brown Prof. Albia Dugger Miami-Dade College The Multiple Dimensions of Food Safety Unit 32. REGULATIONS ON AFLATOXIN IN LIVESTOCK FEEDS AND Current STATUS OF ANIMAL FEED REGULATION IN Nigeria Joseph Nyager (DVM, MSc) DIRECTOR/CVO FEDERAL. REGULATING AFLATOXIN CONTAMINATION IN FOOD PRODUCTS BY RAYMOND N. WIGENGE Director of Food Safety Tanzania Food and Drugs Authority. Chapter 23 Animal Health Care Health Care Science Technology Copyright © The McGraw-Hill Companies, Inc.
Update on PED Research Lisa Becton, DVM, MS, DACVPM Dir. 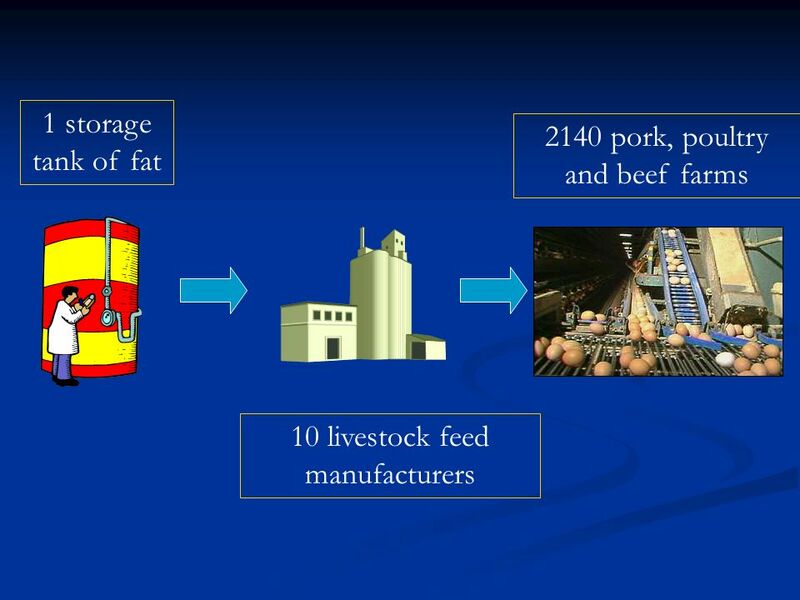 Swine Health Information & Research National Pork Board. 1 Quality and Consumer acceptability Prof. I.E.Psomas Laboratory of Food Hygiene School of Veterinary Medicine Aristotle University of Thessaloniki GREECE. Allen Rudman, Ph.D. Acting Director Senior Science and Policy Staff Office of Food Additive Safety, CFSAN June 14, 2012. Opportunities for Prevention & Intervention in Child Maltreatment Investigations Involving Infants in Ontario Barbara Fallon, PhD Assistant Professor Jennifer. CODE OF PRACTICE AND COMMODITIES STANDARDS, PRESENTED AT NIGERIA AFLATOXIN WORKSHOP BY STANDARDS ORGANISATION OF NIGERIA. 1 Aflatoxin exposure, health impacts, risk assessment and database Aflatoxin Stakeholders’ Workshop 3-4 December, 2012 Dar es Salaam, Tanzania. 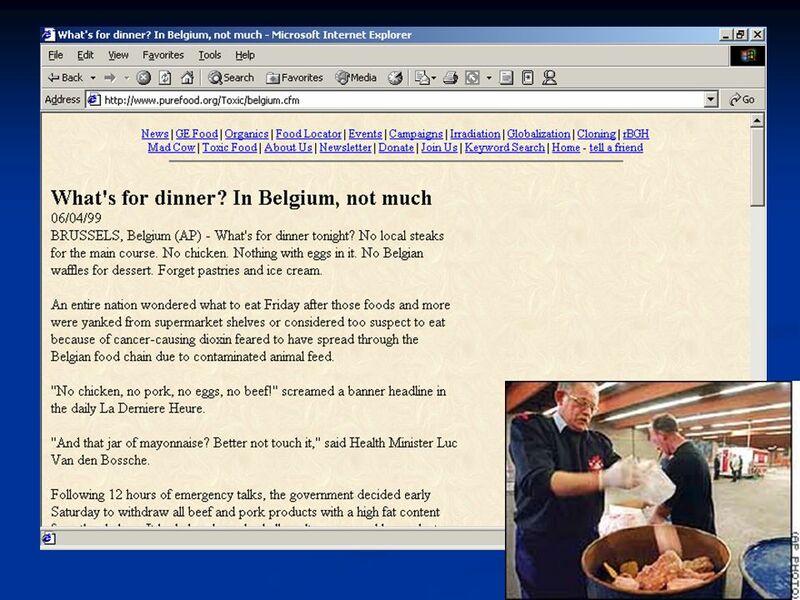 Food Borne Illness What does it mean? How does it affect me? BISON PRODUCERS OF ALBERTA CANADIAN BISON ASSOCIATION ANNUAL CONVENTION NOV Regina Saskatchewan. FOOD SAFETY. What are some food safety concerns? Food spoiled by bacteria Contamination of food Hazardous items in food.